Collectors frequently sell old Sinclair products on eBay.co.uk. Click the "GO" button on the left to find any Sinclair PC200s being auctioned. Amstrad's Sinclair PC200 was a radical departure from anything previously produced under the Sinclair label. In effect, it was Amstrad's attempt to tap the market at which the QL had been targeted - the serious user or small businessman on a tight budget. The machine was a severely cut-down PC with an Intel 8086 processor, CGA video card, 512K of memory and no hard disk. The machine came with MS-DOS 3.3 and the GEM desktop system from Digital Research. Its memory could be expanded to 640Kb and an Intel 8087 maths co-processor could be added. Although two expansion slots were provided, the design of the case meant that they could not be housed within the machine - the top cover had to be permanently removed. This severely limited its expandability. Nothing about the PC200 was original: it was simply a repackaged version of the PC20 which Amstrad had earlier released in the United States. The monitors which could be used with the machine, the colour S14-CM and monochrome S12-MM, were similarly rebadged - the former was based on the popular Amstrad PC1640 and the latter on the Schneider (Amstrad's European trading name) MM12 monitor for the Euro-PC. 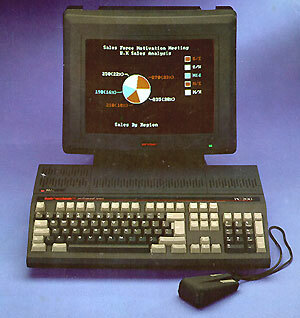 The only peripherals produced for the machine were a standard black Amstrad mouse and the SPJ-1 analogue joystick. Considering that the PC200's main rivals were the far more capable Atari ST and Commodore Amiga, it is not surprising that the machine was a dismal commercial failure. Today it is extremely rare.